Bristol We spent hours in Bristol talking about how to use technology and tech tools in organizing including a Skype call with experts in Washington and our folks from Canada, England, and France. The short summary is the one we already knew going in: nothing is perfect. Everything we tried had gaps, hidden costs, and aggravating features. There’s nothing appealing about making decisions where you know from the beginning that no one is going to be completely happy no matter what. Bad memories of endless discussions from different advocates and fans of different database systems when we were forced to decide on one for everybody came roaring back at me like nightmares. I spent time before that call, talking to Kentaro Toyamo, professor at the University of Michigan, author of Geek Heresy: Rescuing Social Change From the Cult of Technology, who suffers through my techno-peasantry while trying to help me figure out a way to milk advantages from tech potential. The question I posed was whether there was a way to combine locational and relational algorithms, similar to those used by Google, Amazon, and others to allow people to find each other – and an organization – when they faced issues in their tenant block, neighborhood, or workplace and wanted to organize to deal with it. The answer was kind of a “yes, maybe,” but the caution he remarked in developing an independent application or something that triggered to a website was the mountain to climb to the find the crowd versus trying to navigate Facebook where the crowd already congregates. The continuing dominance of Facebook almost argued that it made sense to try to develop an app for that, rather than one that was independent, just because of the pure volume of users and the ease of use and adoption. Though Facebook is made of “likes,” it’s just hard to love from the fake news to the constant advertising, data mining, and self-absorption from the top down. Yet, it’s hard to argue with success and when you are trying to work with people, there’s no way around going where people are, and that’s Facebook today for many hours of people’s day it seems. We spent a lot of time and started building some affection for ActionNetwork.org and its tools. We found the gaps obnoxious, but found the ease of use compelling, along with the fact that the nonprofit operation was created by people with organizing experience who seemed as least receptive to our particular needs.We’re likely soon to decide to go in that direction, all things being equal. We were also taken with Slack.com as well, which is a free service used extensively by the Sanders campaigns to link volunteers and more recently by activists trying to connect and organize in the US period of chaos and resistance. ACORN in the UK has been using Slack to do daily communications with organizers and allow them to add channels for work projects. I’ve been trying it with slightly less success with my research interns at the University of Ottawa as well.Nonetheless, I found it very, very easy, and way better than something like Dropbox to move large documents effectively to the work team, so that’s something to love, but no matter the tool, it only has value if people use it. How an organizer would keep up with 1600 Slack groups is still beyond me, no matter how easy it is to use, but that’s something worth learning. So we get back to Facebook groups, which we use, and our members love in dealing with tenant support issues in the UK, mental health rights in Alaska, and disability rights in Vancouver. Hard to beat. No matter what works in theory, we have to go where people are. New Orleans Talking on KABF’s Wade’s World to Kentaro Toyama, tech wizard, author of Geek Heresy: Rescuing Social Change from the Cult of Technology, and for now a Professor at the University of Michigan’s School of Information, was fascinating. As we went back and forth about his stimulating, bubble-bursting book, we talked a bit about the problems of scale, much needed, but hugely difficult to achieve in social change, as well as technology, and maybe joined together, twice as hard for all I know. This is something that Toyama is still spending a good chunk of time thinking about and researching now as well, and he was he was spot on in calling me out as well for having spent decades on the practical problems of achieving scale in community and labor organizing. Toyama might call it something different, but the problem and potential starts very simply, though many might both disagree and ignore this, by looking backwards. To get to scale something has to be replicable. To be replicable it has to work. To work in many places there has to be a model. If it isn’t replicable, it may be an innovation, it may be a revelation, it may be the best thing since slice bread in whatever field of endeavor, but whatever “it” may be, no matter how wonderful, it’s not a model. Not to get off on a tangent, but it is amazing how many people stumble right at the gate and blur the distinctions by referring to one-off experiences as a model even though they have not been duplicated and perhaps are unable to be duplicated. A sure sign is in the “secret sauce.” If it’s a secret, it’s not a sauce easily cooked by others, so it may be amazing, award winning, and game changing, but it is not a model, and it will live – and die – right where it was born in all likelihood no matter the ingredients. Organizing is an amazingly creative and courageous affair for many. I’m now reading a book about the civil rights organizing in Sunflower County in the heart of the Mississippi Delta being done by SNCC and Mississippi Summer workers in the early and mid-1960’s, which is always inspiring. Having spent time there over the years, where my grandparents lived and my mother and her brothers were born and raised, all of the little, similarly sized towns would seem about the same to someone just driving through, and most would just step on the gas and be done with it. Ruleville though was a hot bed of organizing, while Drew, only a few miles down the road, was a wasteland. The organizers were the same, their approach, their canvassing, their issues, and their campaign was all about the same, but there was never what might be called a model, because with replicability in an organizing model, there also has to be a high level of predictable success within acceptable ranges. Ruleville turned out to have a different economic base allowing more membership protection. 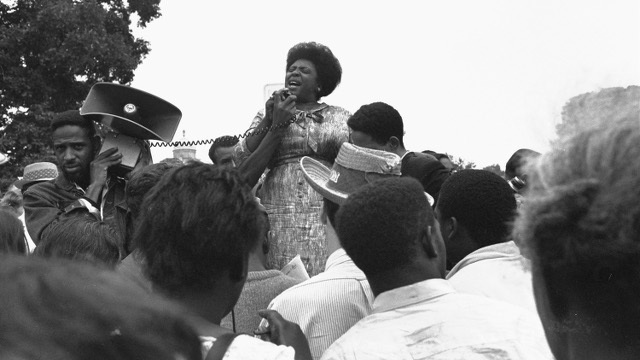 Ruleville also had Fannie Lou Hamer, an exceptional, unique leader to keep the fight welded together and sustain the momentum. Leadership is central in all effective organizing models, but for a model to work it has to depend on standard off-the-shelf, garden variety leadership – and organizers – within the range of normal human capabilities, rather than unique one of a kind leaders like Hamer or organizers like Bob Moses. There have to be resources, there has to be sustainability, and there even has to be a reasonable expectation of success in widely different situations and environments before there is a model. Too many simply think if something worked well one place, it’s just add-water-and-stir, put in more, and wham-bam, there will be more, but even before we cross the bridge in creating social change to scale and the myriad challenges and obstacles that lie on that road, if there’s not a real model as the foundation, none of us will be able to get there from here.